Do I Need Braces for My Kid? Why? Do I Need Braces for My Kid? My 10-year-old just got back from the orthodontist and now she’s getting braces – just like her older sisters did and each and every one of her 10-year-old friends. Oh joy! If this is going to help my little princess be healthier, I’m all for it – even though it’s going to cost me about $5,000. But sometimes I think the braces “thing” is just one of many smart business ideas by dentists. When you were growing up, how many kids in your class needed braces? Maybe two or three, tops. Right? I never had braces. 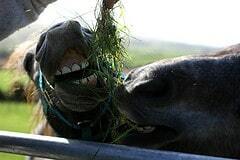 Heaven knows I don’t have any problem eating and I didn’t end up looking like Mr. Ed or Seabiscuit either! Why does every kid I know have braces these days? I am not an anti-dentite but I don’t like it when someone takes a bite out of my financial resources. And I sometimes feel like the dentist has me over a barrel. “What kind of father argues against giving his child medical attention?” I hear myself saying. Am I a rat to even question the dental profession? Of course I respect dentists. I just don’t understand why everyone needs braces now but when we were kids, nobody did. Do you ever feel like I do? How did you resolve this issue? Can you explain this to me? Would you cash in your old 401k if that’s what it took to get your kid braces? I am 35 now and wish my dad had been money-wise enough to have been able to pay for braces. My teeth are larger than my small mouth, which makes my teeth crowded and misaligned. Even with proper personal care, I’ve developed periodontal problems. America’s so-called obsession with proper tooth alignment could easily be saving lives. Yes, braces cost quite a bit of money, but I would consider them an investment in dental health if I had a kid. And braces aren’t just for kids, either. I once had a boss who had braces and she was in her 50s at the time. I’m with Nancy from Massachusetts though–why company dental plans only cover a certain amount for ortho care, if at all–is beyond my comprehension. They consider it “cosmetic,” but too much misalignment can be problematic in the long term, health-wise, and it is no longer “cosmetic,” but could be life-threatening. I, too, would be willing to pay more for them to cover more, even if the braces are only for me. Of course I am sorry about this outcome. But when I was growing up very few kids had braces. I conclude that they didn’t need them and they didn’t develop these problems – or at least those who were correctly diagnosed. Why are more kids getting a different diagnosis now? When I was a kid, only Jewish kids had braces. I thought they were a religious symbol. I thought since every Bar Mitzvah kid had to say the prayers through them, that made us more religious. They hurt like hell, the dentist kept tightening them, and you had to wear rubber bands to old your uppers & lowers together. Two years of hell. In the end, I don’t think they did anything for me, but I’m sure they help put the orthodontist’s kid through college! On the other hand, my cousin is an orthodontist, doing very well, and putting his own kid thru college. Thanks for linking back to the carnival AND linking to my dental insurance post. I have always thought the same thing about braces… the reason they are so predominant is because we have allowed it, unfortunately! Glad you liked my article! Thanks for sharing it here. I never needed braces growing up, so maybe your theory is right:) My sister did, though. And I had another close friend who did. I guess it’s better to have them on earlier than later – whenever I see someone with braces now it makes them look a heck of a lot younger:) maybe there’s a strategy there…. as a Canadian, I can say that we care about white teeth too:)! But I’ve never filled out any questionnaire all about teeth whitening like ERE did. Interesting. Should compare with the coffee-consuming nations like Finland. That makes me sad and angry. Maybe I won’t be asking your dentist for a second opinion after all. Would it be safe to assume that your country of origin has a lower incidence of braces? If so….I’m moving! American’s have this fetish about straight blue/white teeth for some reason that nobody else shares. I remember the first time I signed up with a US dentist and I was puzzled why one quarter of the questionnaire was dedicated to teeth whitening. I have never seen that before. In the rest of the world, teeth are cream colored (their natural color) and you only get braces if your teeth are so out of order (or whatever it’s called) that you have problems chewing properly (and that is rare). I think orthodontics is one of the top five highest paid professions; it’s like plastic surgery for your teeth in many cases … not needed. Yes, but when I explained to them that my husband was laid off and we couldn’t afford the spacers at this time, they replied: “well, since your insurance would cover half the spacer cost, you can pay us monthly on the balance and then you’ll only have to worry about paying for the braces later.” (would cost us monthly for about 2 years!) Apparently, they’ve never had a spouse laid off and trying to keep expenses at a minimum. Seems like your son has a real need for this. I wish I had your dentist…. I’m in the same boat. My son is turning 10 this August and his teeth are coming in crooked. hardly anyone I knew growing up (in the 70’s and 80’s) had braces. actually only the kids whose parents had money, had braces. We have been told that my son needs spacers put in for a year or two prior to the braces even being put on. my dental plan only covers $2k in orthodontia for LIFETIME, and the spacers alone cost 4k, with the braces coming in at another 5k. if the insurance covers half the spacers, that means we will have to pay full cost on the braces. He will need them though, his are just like mine on the bottom which are crowded and hard to floss. I think insurance should be re-written to help cover more ortho costs…I’m willing to pay more for dental insurance for them to cover more!